Los Angeles hard rockers HEAVEN & EARTH release HARD TO KILL, October 6 on Quarto Valley Records. It’s available to pre-order via HEAVEN & EARTH’s PledgeMusic campaign. In addition to pre-ordering HARD TO KILL, fans can purchase a range of exclusive merchandise and special offerings from the band, including signed albums, guitars, posters and lyric sheets, Skype lessons with each band member, and even a Skype cooking lesson with singer Joe Retta. A lyric video for “The Game Has Changed” was recently released and can be seen on the band’s official YouTube page. It will be available on iTunes September 22. 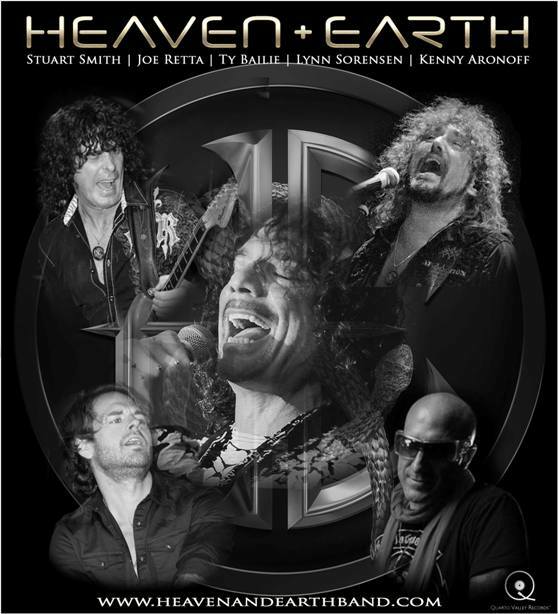 HEAVEN & EARTH features Joe Retta (lead vocals, guitar, harmonica), Stuart Smith (guitars), Lynn Sorensen (bass and vocals), keyboardist Ty Baillie (who has played with Katy Perry and Robbie Robertson), and essential to the album with his songwriting and drumming is Kenny Aronoff, who has been a sideman to countless bands both live and in-studio including Bob Seger, John Mellencamp, and the Rolling Stones. His distinctive style and energyis one to behold on HARD TO KILL. While on tour, the band includes musicians Mike Mangan (Hammond organ and keyboards) and Steven Wilson (drums, percussion, vocals). ago, when both men were touring with The Sweet, known for the classic hits “Ballroom Blitz” and “Fox On The Run.” After developing a strong writing partnership, Retta and Smith joined forces to continue the HEAVEN & EARTH legacy. HEAVEN & EARTH--the Los Angeles-based quintet who masterfully fuseelements of hard rock, blues and bits of classical on their acclaimed album Dig, which they toured Europe in support of throughout 2014--are back in the studio working on a new album (produced by Dave Jenkins and available via Quarto Valley Records) set to be released this fall (title and date TBA). In between writing and recording the new album, HEAVEN & EARTH--Stuart Smith (band founder/guitarist), Joe Retta (vocals), Kenny Aronoff (drums), Lynn Sorensen of Paul Rogers/Bad Company (bass/vocals) and Ty Bailie (keyboards)--will make an appearance at the Vasby Rock Festival in Stockholm, Sweden on Saturday, July 17. Simon Wright (AC/DC, Dio) will be filling in on drums for Aronoff, the band's regular drummer, as he's currently on tour with John Fogerty. Says Stuart: "We've been hard at work writing for the new Heaven & Earth album which has been a long process as we felt we had a lot to live up to after Dig. We spent 14 months crafting and recording the songs for that album--and after all the positive reviews and press, myself and Bruce Quarto, our record company president, felt that we had to bring out something equally as good or better. We've been aiming for the 'better' end of the bar we previously set." Stuarts adds: "I'm pleased to say that we've got quite a few new songs that we're really happy with and will be releasing a few teasers very soon. We'll also be debuting a few songs off the new upcoming Heaven & Earth album at the Vasby Festival this month so we're really looking forward to that. On a personal note I'd like add that I'm really looking forward to playing live for the first time my 'Stuart Smith Signature Model' guitar built by Aero3 Guitars. It's been sounding amazing on recordings and rehearsals but I'm looking forward to blasting it out at a big festival." HEAVEN & EARTH's third studio album, Dig--released April, 2013 on Quarto Valley Records--was produced by Dave Jenkins--who's turned the knobs for everyone from Metallica to Tower of Power. The album features special guests Howard Leese (Heart, Paul Rodgers), Richie Sambora (Bon Jovi) and David Paich (Toto). HEAVEN & EARTH's music comes together explosively on the album's first single "No Money, No Love" and its controversial video which has logged over 545,000 views and can be viewed here: http://tinyurl.com/cdopr5d. Stream Dig onSoundCloud or Spotify now. The origins of HEAVEN & EARTH align the band's founder and visionary, Stuart Smith, with a rich lineage of rock's most celebrated musicians. Kelly Hansen (Foreigner), Joe Lynn Turner (Rainbow) and Kelly Keeling (King Kobra) all fronted the band at various junctures. Guitarists Richie Sambora (Bon Jovi) and Howard Leese (Heart, Paul Rodgers), singer and bassist Glenn Hughes (Deep Purple, Black Country Communion), bassist Steve Priest (Sweet) and drummer Carmine Appice (Jeff Beck Group/Vanilla Fudge/Rod Stewart), among others, have each contributed their extraordinary talents to HEAVEN & EARTH's first two albums: Heaven & Earth Featuring Stuart Smith (1994) and Windows to the World (2000).HEAVEN & EARTH's groundbreaking debut album, Heaven & Earth Featuring Stuart Smith, is considered a cult classic and brought Smith to the forefront of the guitar elite being compared in the press to Deep Purple's Ritchie Blackmore,Jeff Beck, Eric Clapton and Jimmy Page and garneringSmith the award for "Best Guitarist" and "Best NewCD" for three years running at the Los Angeles All Access Music Awards. In the summer of 2012, the guitarist set out to mold HEAVEN & EARTH into a world-class recording and touring band which led to the recording of their new album Dig and now the future has never looked brighter for the band. “This is without a doubt the best sounding and easiest to play guitar I have ever held in my hands. As some of you will know I have been a Strat player for all of my life so it was a huge decision for me to even think about using a different instrument but the minute I picked it up and plugged it in I knew this was the guitar sound I’d been looking for all my life. The sustain is unbelievable, even at low volume and it only weighs about 6 pounds compared to the 9 or 10 pounds my Strat’s weigh. The workmanship is first class and the neck feels like butter”. “We thought for 2+ years about what Aero 3 was and is to become. We are not to be a Me-Too guitar builder. There are many guitar builders that build fine guitars; however, many guitars are not changed other than for the sake of aesthetics. While on the outside an Aero 3 guitar may look similar to other brand name guitars. Aero 3 guitars are different on the inside; different in that we have infused aerospace technology; the total remolding of the guitar on the inside makes all the difference. From tactile response, tone, sustain and playability, Aero 3 guitars are a game changer”. “Rob reached into the heavens to grasp the aerospace technology and infused it with the woods of the earth; therefore it is fitting that Aero3’s first sponsored guitarist is Stuart Smith from Heaven & Earth”. Stuart Smith is an award-winning guitarist who was mentored by Deep Purple’s Ritchie Blackmore. His band Heaven & Earth released their third album, “Dig” in 2013 to rave reviews. The band went on to tour Europe during 2014 and are currently writing and recording their next album, slated to be released later this year. The present line up of heaven & Earth consists of Stuart Smith-Guitar, Joe Retta-Vocals, Lynn Sorensen-Bass, Kenny Aronoff-Drums and Ty Bailie-Keyboards. With thanks to Quarto Valley Records and Heaven & Earth, MelodicRock.com can offer a few very special deal on Heaven & Earth’s most recent album Dig. It can be purchased direct from MR at just $8 each (plus shipping). There is also a bundle of signed items available – JUST 2 PACKS LEFT!